Like Madam Rue’s “Love Potion Number Nine” – only better! If you like okra, now is the time to take advantage of it before the fall sets in. I recently purchased some at the State Farmer’s Market – if you go there, I recommend walking around and checking out the prices before buying because there are some stands that give you better deals than others. 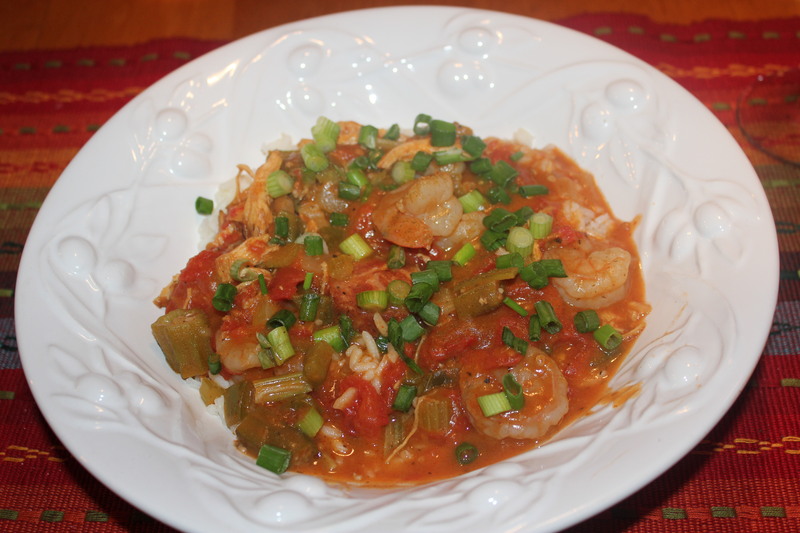 I used some of the okra to make this wonderful shrimp, andouille sausage and chicken gumbo – it is delicious! 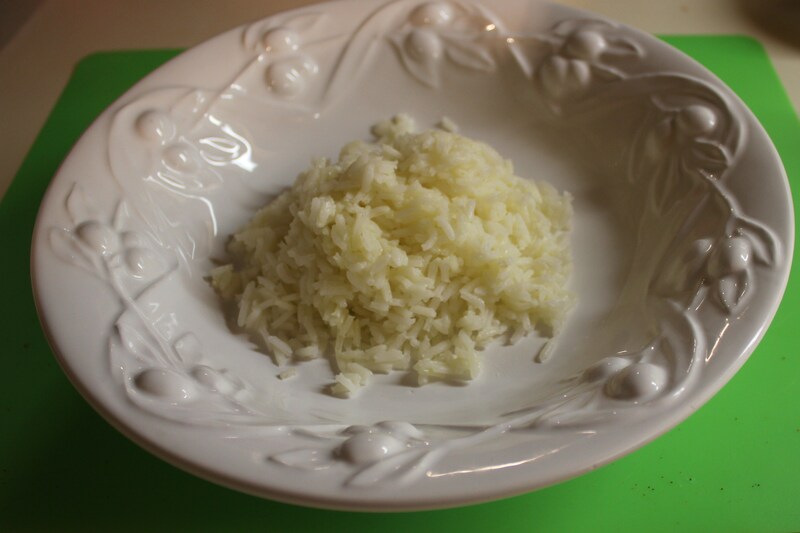 I serve it over hot white rice, which I make so it will come out right when the gumbo is ready. heat. Drain on paper towels to absorb any oil. Heat 2 teaspoons of oil in a medium skillet. Season the chicken breast on both sides with the cajun seasoning. 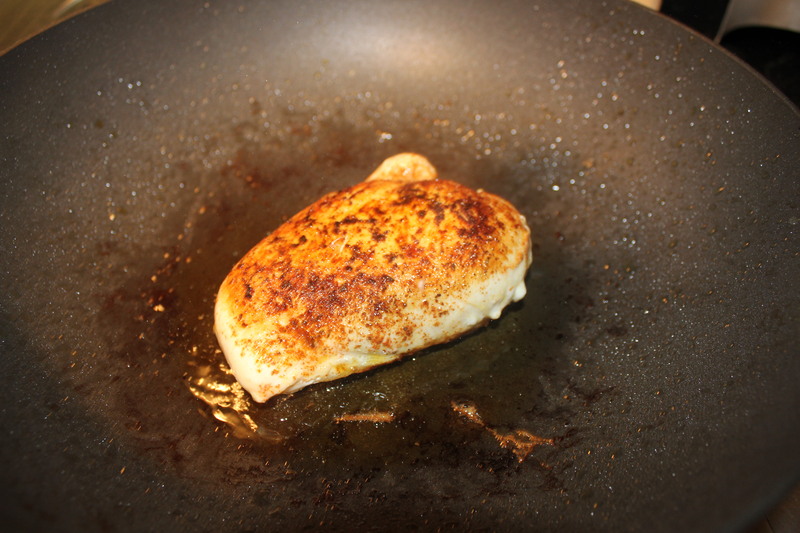 Saute until the chicken is brown on all sides and reaches an internal temperature of 165 degrees. Drain on paper towels, and shred into small pieces once it has cooled down. 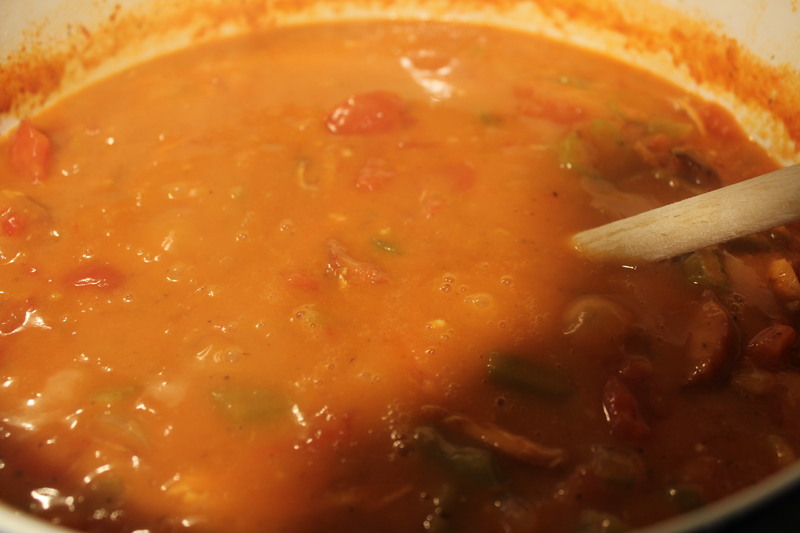 Make the roux by stirring the flour into hot oil, a little at a time. 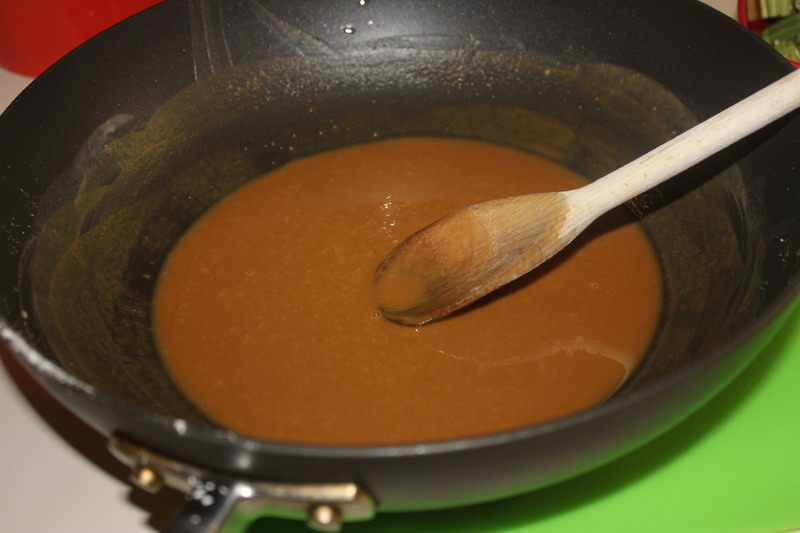 You want to wind up with a smooth paste that is the color of warm caramel. This step takes 35-45 minutes and frequent, frequent stirring, so it’s good to pour a nice glass of wine or coctail of choice before you start this step. Remove from heat and stir occassionally as it cools. In a large casserole or dutch oven, melt the butter. 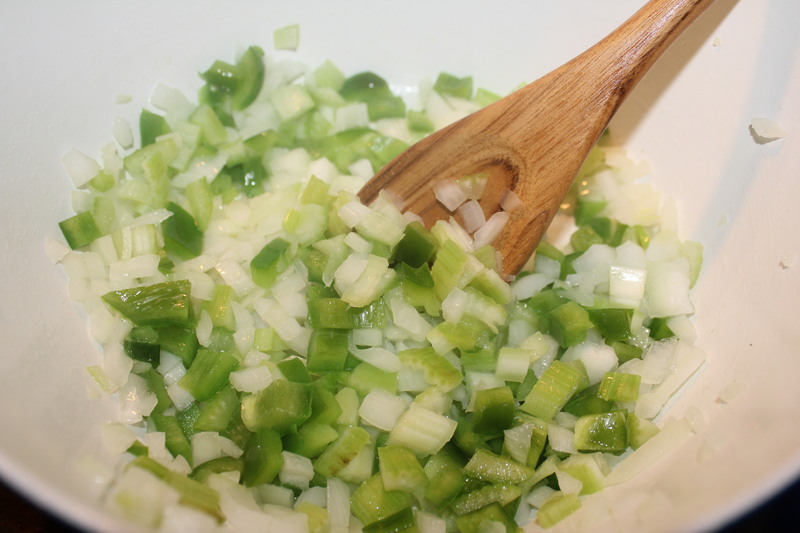 Add the onions, celery and green peppers, and cook over meduim heat for 3-4 minutes. 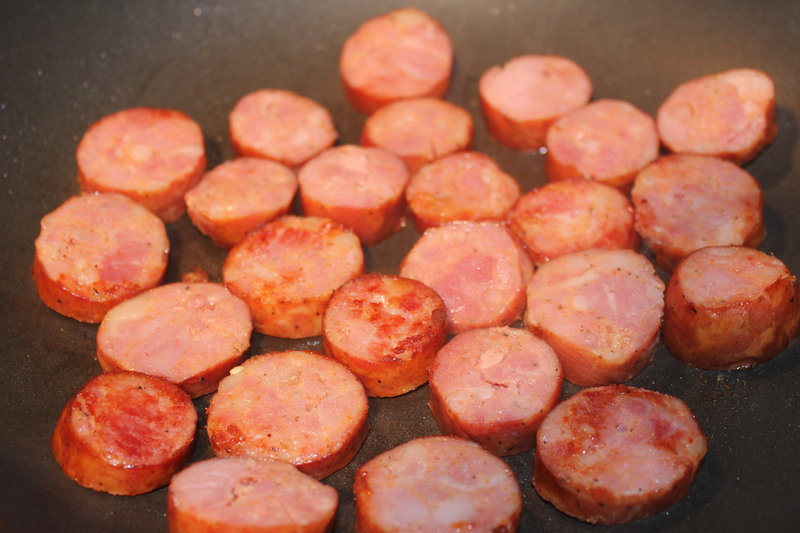 Add the sausage and cook for 5 minutes. 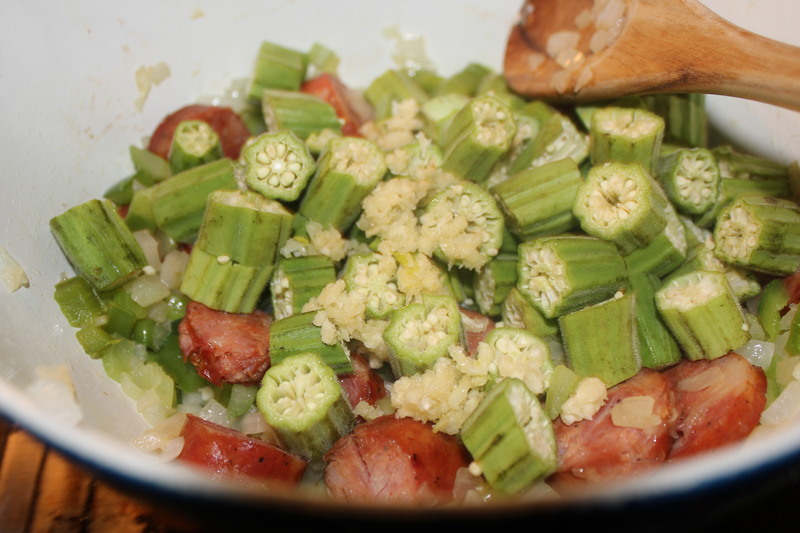 Stir in the okra and the garlic until you can no longer see the white “threads” coming from the okra. 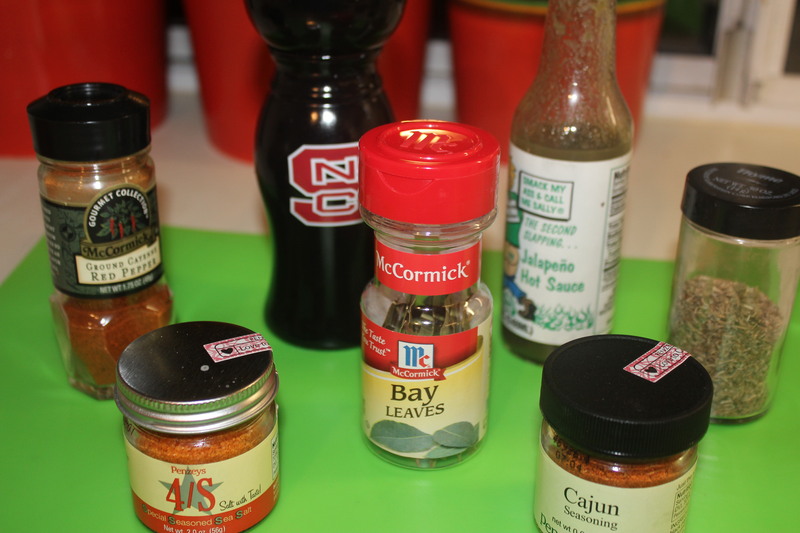 Add the salt, black pepper, cayenne pepper, thyme, bay leaves, cajun seasoning and hot pepper sauce. 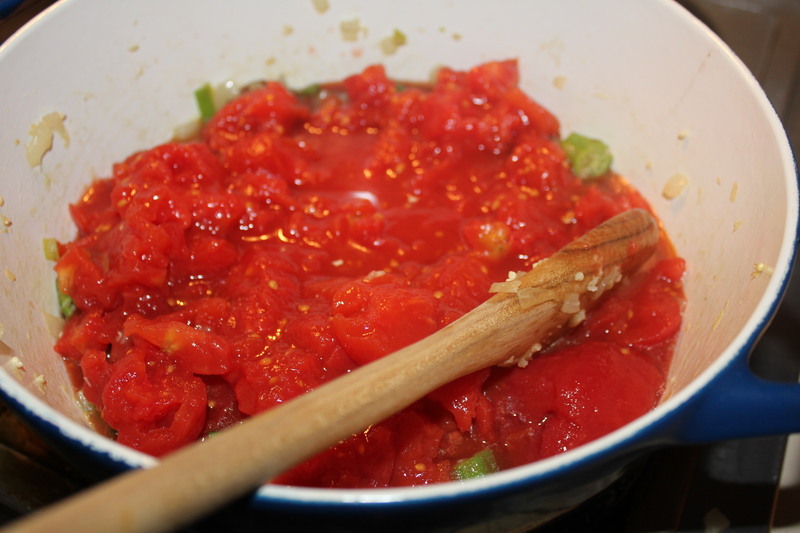 Place the plum tomatoes along with the juice in a large bowl and break up the tomatoes some with a spoon. Add them and 3 cups of water to the sausage and okra mixture. 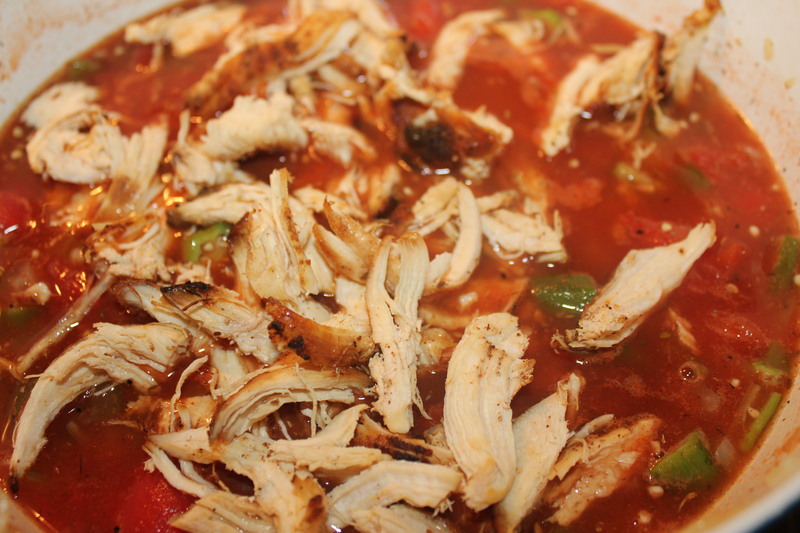 Stir in the shredded chicken, bring to a boil, and simmer for 30 minutes. 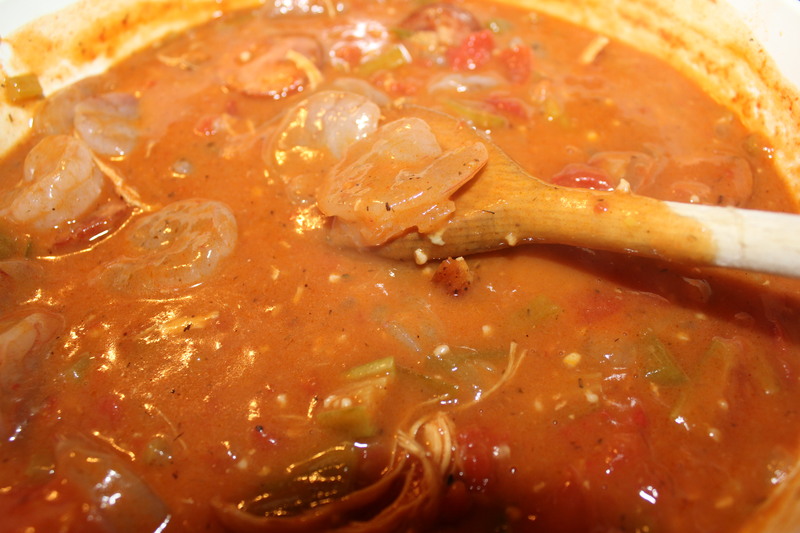 Add the roux, bring to a boil once again, then lower the heat and cook for 15 minutes. Stir in the shrimp, and cook until the shrimp turn pink, 5 minutes or so. 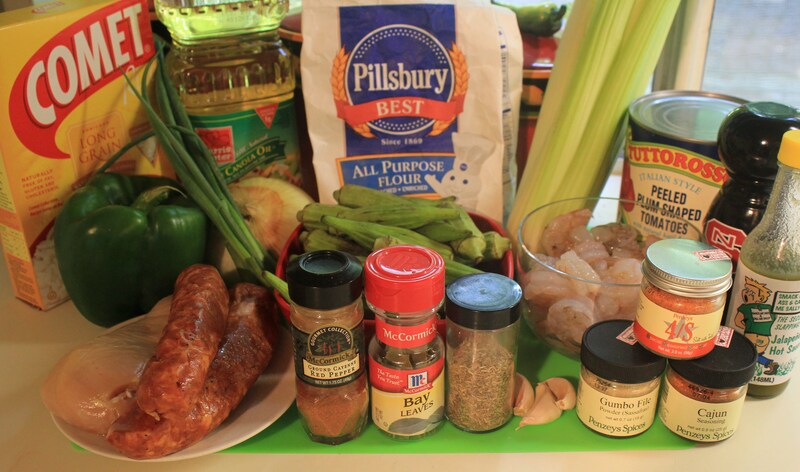 Serve the gumbo over hot white rice, making sure to include some of the shrimp, chicken and sausage; sprinkle with the file powder and some of the cut spring onions. 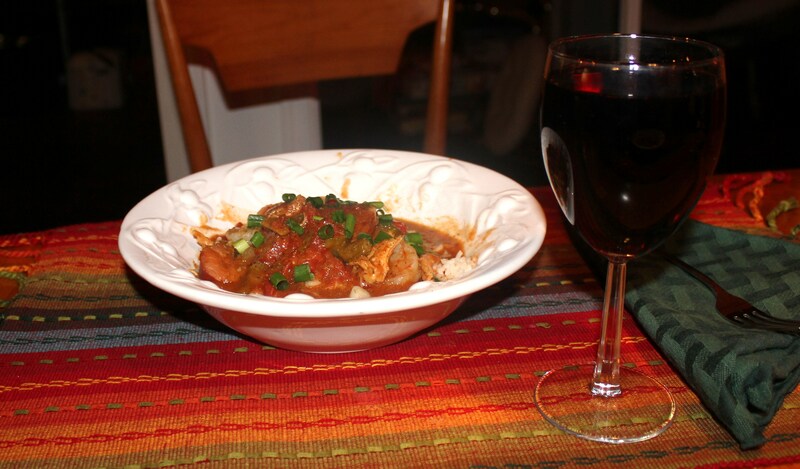 This entry was posted in Meat and Poultry, Recipes, Soups and Such and tagged eat drink and be merry, gumbo recipe, gumbo recipe Kel's cafe, kel's cafe of all things food, Kelley Chisholm blog, okra gumbo, seafood sausage chicken gumbo, seafood sausage gumbo. Bookmark the permalink.